we walked through this typical Japanese arch onto the premises of what we soon learned was a shinto-shrine. Various wooden buildings with the beautiful bent tiled roofs, some with entrances behind a row of similar arches. Various people performing rituals. Among other stone statues there was also a "Manneke Pis". We looked at all this with interest, when a man addressed us. If we would be interested to know more about praying in a shrine like this, and before we had answered he assured us that it was no temple. His English was rather modest, but we learned a lot. The Shinto religion knows various gods, a bit similar to the Greek gods, we were told. These gods are like humans, they have their good and their less good qualities. They do not punish when a beleiver has done wrong. They will question the wrong-doer about his motif, not judge him. Quite contrary to most monotheist religions that the world knows. The man was very particular about how prayers should be done. He handed us over a scheme that is meant to make it clear to the foreigner (see photo). And indeed, as he performed the ritual for us, it became clear. 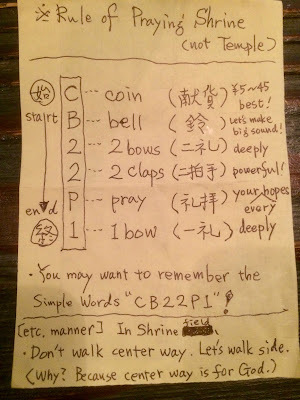 Not very difficult at all: check the note he gave us. 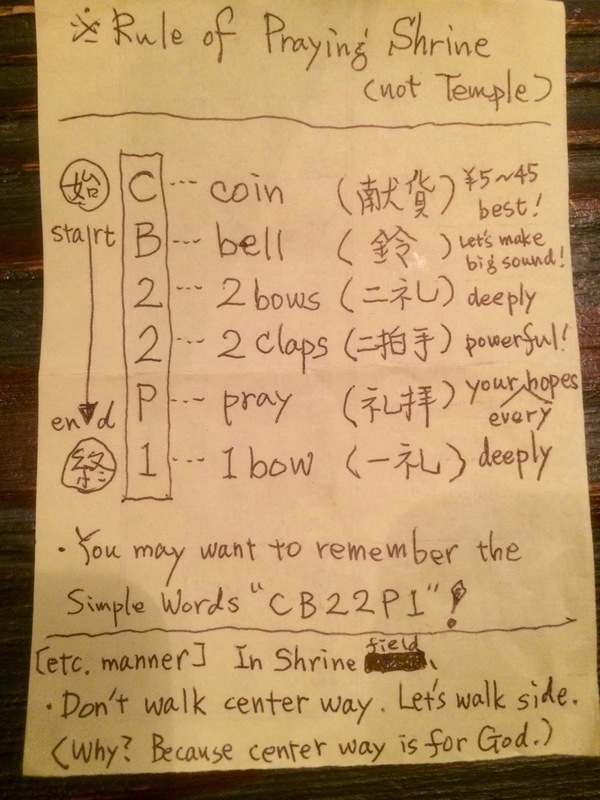 Walk up to the shrine and donate a coin (very little amount) in the big bowl or stone jar, then pull the bell cord hard so that the bell strikes loudly, make 2 deep bows, clap your hands twice and loud, then say your prayer (= express your hopes), make one bow again, step backwards and leave. Done.